The origin and the limnology of the Ethiopian Rift Valley lakes have received less attention from scientists than some of the larger lakes further south. Despite the fact that these lakes are of great importance to the economy of Ethiopia, and are critical to the survival of local communities, there were no intensive and extensive limnological studies on these lakes until recently. It became obvious that the Ethiopian Rift lakes can serve as a natural laboratory for comparative limnological studies due to their unique chemical, physical and ecological features. They also proved to be very sensitive indicators of past and recent climatic changes that took place in this particular area of eastern Africa. Recently, several excellent books have synthesized the available information in the areas of geomorphology, climatology, and limnology of African Great Lakes, but very little information has been synthesized on the Rift Valley lakes of Ethiopia. Since significant limnological data have accumulated on the Ethiopian Rift Valley lakes, but these data are spread out in various publications, many of which are not readily accessible to the international scientific community, a book to synthesize most of this literature is necessary. It is hoped that this book will stimulate the interest and curiosity of many limnologists around the world. The various chapters will provide a comprehensive coverage of the literature, and deal both with past and ongoing work on Ethiopian limnology and fisheries. There have long been many studies of the waters in the southern parts of the African Rift Valley, and these are frequently referred to in several chapters of this book; but the northern, Ethiopian, part of the valley and its adjoining uplands was not included in that early work. Presumably that was partly because Ethiopia was only briefly occupied as a colony by a European nation, and partly because the enormously dissected nature of the highlands has always made travel there very difficult. However, biological investigators from other continents have always been attracted to the study of African biota, and, as is well documented in this book, there were several papers published on fish and other aquatic organisms of the country by visiting scientists during the first two thirds of the twentieth century. I, indeed, was one of them, because with my long-term interest in aquatic biota, I always carried a bug net with me during my twenty months of extensive travelling around as the junior member of The Locust Control Mission to Ethiopia during the second world war, and that enabled me later to write a paper on the aquatic Hemiptera. The compelling interest of the Ethiopian biota is not only that it is upland African, but that it is part of the tenuous biogeographical link with Eurasia. For instance, Tilapia nilotica, which at one time was called manus-christae, occurs in both the Awash and Jordan River basins, and one can find the European river limpet Ancylus fluviatilis in Ethiopian streams. Ethiopia, moreover, unlike other African lands, shares roses with Europe. It has long been clear that lakes are an important resource for the peoples of Africa as producers of both water and food fishes, as well as sources of disease such as Schistosoma, Dracunculus and malaria, so the need that they be managed effectively has long been obvious. It is therefore heartening that several agencies have supported research on Ethiopian lakes during the past few decades, and that this has been done, not only to gather data and enhance understanding, but also as a means of training a cadre of local people in the sciences of limnology and fisheries on which such management has to be based. This is very apparent in the names of the authors of chapters in this book, many of whom are Ethiopians. To that extent, this publication marks a turning point in the history of aquatic science in the African continent, and it is heartening to see that the final, integrative, chapter on threats and strategies for the conservation of the lakes is written by Dr. Zinabu Gebre-Mariam, an Amhara who lives on the bank of Lake Awasa. In short, I regard this book as marking two important achievements. 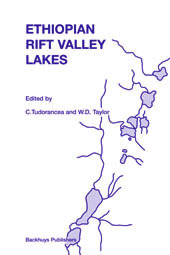 The first is that it summarises what is so far known about the lakes of the northern part of the Rift Valley and it gives access to the literature to date; and the second is that it provides a solid basis for further limnological work in the area, which, one hopes will be largely done by local scientists to the benefit of both scientific knowledge and their native lands. Africa will benefit enormously from their contributions.